Defy the rules of mathematics and create a conical corner with this Cono Side Table. Cono's wire base is all about remaining compact even though it packs a big punch of stability for its sheet metal tray top complete with a lip that ensures your drink and everything else will stay put. Handmade and designed in Los Angeles, CA. Wire base with a fixed sheet metal tray table top. Structural and durable base allows for maximum stability and weight distribution. Compact design can create a cozy corner with a couple seats. Features 1 inch table lip. 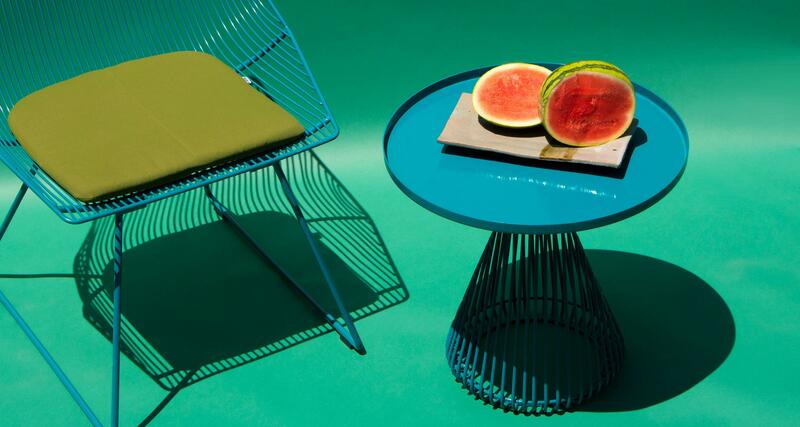 Just as lines are written to create a story, Bend Goods' striking chairs, stools, and tables utilize lines to create structures that are inspired and versatile - spicing up indoor and outdoor spaces alike. Gaurav Nanda, founder of Bend Goods, has been designing, building and bending since he was a young man, growing up in Detroit.